This new, expanded edition of The California Indians is a more comprehensive and thus more useful book than its predecessor, which first appeared in 1951 and was reprinted seven times. The editors have combined the selections, eighteen of which are new, into a general survey of California Indian native cultures. They have avoided highly technical studies because they intend their book for the general reading public rather than for scholars. 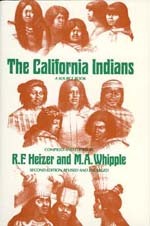 The editors discuss the present-day Indians of California in a chapter written especially for this volume, and provide a new, extensive classified bibliography listing hundreds of published works arranged by culture areas and subjects. This list of references should prove useful to the nonprofessional who wishes to read further on a particular tribal culture or topic, such as Indian basketry or place-names or prehistoric rock art. Mr. Heizer (1915 - 1979) was professor of anthropology at the University of California, Berkeley, and the author of many books dealing with American Indians. Mrs. Whipple (1893-1979) was a former editor in the same department.